I hope you read my editorial. You see, I have this boyfriend- let’s call him “D” for short. We have been together for over two decades now. You’d think he would have proposed already, but in his usual fashion D always takes me on an emotional rollercoaster. There are lots of highs and lots of lows. Some days are okay, and those are the days where I think D isn’t so bad. I mean, he loves me! I swear he does! People always look at us on the street together. We have all the fanciest technology and we sport it around town wherever we go. Some people stop me and say that they’re proud of us, of the relationship that we’ve built. It’s not easy, they say. But they don’t really know the reality of living with D.
D keeps me up at night a lot. He is loud and needy and incessantly wants to eat. In some ways it’s like tending to a child. And then I have to go to work the next day, and then go to graduate class after work, and society tells me that I should not complain. “D is not THAT bad. There are always worse boyfriends to have. Plus, my grandma dated a guy like D- haha D type 2!- and she just took a few pills to get over him.” They don’t see that D makes me cry sometimes. He can be a jerk, and he always acts up whenever something important is happening. On the good days, he makes me laugh, though. And I have found other people who also date D’s, and they have made me feel like we can do this. They are strong people. They are funny people. They know exactly what to say to make me feel better about D.
What can I do to improve my relationship with D? I am not ready to give up hope that we can work things out yet. Coffee helps diabetic eyesight? Count me in. According to the Journal of Agricultural and Food Chemistry, drinking coffee may help protect diabetic eyes from retinopathy. See the article here: http://www.battlediabetes.com/news/diet-and-nutrition/coffee-could-prevent-retinal-damange-in-people-with-diabetes. Howdy, diabetics and people who care a lot about diabetics! Welcome to Very Light, No Sugar and thank you for your support. I am excited to connect with you and to share in our fight to create a world without diabetes. Please read our “About” section and “Disclaimers and Disclosures” for more information. Now, let’s get down to business. 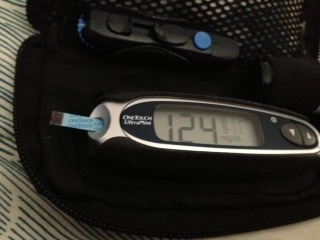 Why blog about diabetes? If you had told me I would be starting a blog at the age of 26 five to ten years ago, I would have thought that was impossible; it was a task for someone else to do. A few years of maturity have changed my tune on this. Why not? Why can’t I simply be one dot who connects other diabetic dots? (And I do not mean the ones on your fingertips from thousands of blood tests)! The bottom line is that curing diabetes is going to take a village of diabetics and their families and friends. If we all come together to raise awareness, to lift each other up on the days when we are exhausted from dealing with low blood sugars all night only to wake up to a rebound high blood glucose of 300, to fundraise, to communicate, to educate others- perhaps we will move forward so that we can one day live in a world where children do not cry about insulin injections, where we do not snap at coworkers when our blood sugar refuses to drop, when we do not have to imagine this burden for our future generations. I pledge to be open, honest, and loyal in our shared battle of defeating this menacing disease while increasing awareness and support along the way. Diabetes is not always peaches and cream, and we should not have to pretend that it is. There will be days where we need a shoulder to cry on. There will also be days where for a moment we seem miraculously cured, our blood sugars hovering in that highly selective “100 Club,” and we will realize that “This- this is what it is like to wake up with properly-functioning islet cells every day!” I pray that one day we will enjoy that feeling every morning, from the perspective of someone who has been in the thick of battle and come out victorious. Until then, let’s share in the struggle together. Thank you for letting me into your hearts (and pancreases), and likewise thank you for becoming a part of mine. and on Instagram at verylightnosugar.